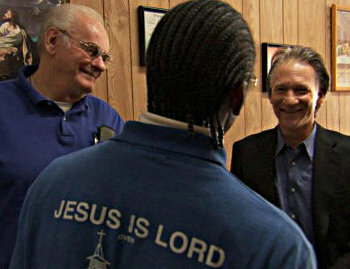 I knew I wanted to see Religulous the moment I had heard of it. So let me give you the setup for my first viewing: there was me (an atheist) eager to see what Bill Maher had in store. Then there was my wife (a Jehovah’s Witness) seated beside me. She probably wasn’t so sure this was a good idea. But I had already put the disk in the DVD player and — more importantly — I had actually bought the damn thing so there was no way she was going to let it go to waste. (My wife comes from a long line of incredible cheapskates, so that was that.) Now I hadn’t previewed Religulous for her or anything like that, so I didn’t know how offensive it would be to her. But I had seen Maher’s interview on the Daily Show where he explained his belief that atheism was a religion. Most atheists would disagree with Maher on this, so I figured he would offend me too. Not so. In fact, I preferred Religulous to many other documentaries of its kind. The documentary crew went across the country, from the Mormon Temple in Utah to a truck stop that served as a trucker’s church in the middle of nowhere, and even went out of the country to interview Muslims and Jews in different parts of the world. No Kingdom Halls (damn) but he did get kicked out of the Vatican. Wish I could add that one to my resume. In case you’re wondering, I didn’t get the sense that Bill Maher was trying to “pick on” religion or its believers, though many of the people he interviewed were clearly uncomfortable with his questions. As many an atheist has noted over the years, believers don’t like having their beliefs scrutinized too carefully. In Religulous, I really felt that Maher was just trying to get to the heart of their beliefs and to understand the thought process behind them. With other shows — such as those by Richard Dawkins — I often felt that the real objective was to point out the flaws in religion right from the start, so it’s easier for believers to just wave their hands and dismiss them as biased or arrogant. That’s not to say that Maher doesn’t point out the flaws. But his approach is just fair enough that believers are more likely to admit it when he’s right. at talkin’ to the chicks than yours truly. The best part for me was that Maher got my wife talking about his views. (Actually, she kept talking over the movie, so I had to keep pausing the darned DVD … yeah, she does that a lot.) Note that my wife and I don’t talk a lot about religion. That’s why we don’t fight about it all the time like many couples do when they don’t agree about religion. So an opportunity for us to share some insights with one another is always welcome. Especially when she’s the one who brought it up. I recommend Religulous to any atheist. Or any religious believer brave enough to have their views questioned. Just don’t forget to check out the deleted scenes in the special features. (Although the commentary track was a bit disappointing. It felt like Maher and the producer were reminiscing about “the good old times” while filming more than they were talking about the actual content on screen.) Religulous was definitely cool. Tagged Religulous, review. Bookmark the permalink. Hey – thanks for the link love here. Very nice! 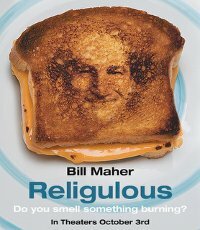 Most interesting to me was that Religulous seemed to track a movement in Maher’s own thoughts. In the first part of the film, he kept trying to pull something authentically spiritual and ethical from the discussions – to make distinctions between the claims and something that could still be salvaged. By the end of the film, he had given up – the major beliefs and practices – and the ways that believers were manipulated – were so toxic that he could only condemn. Glad to have you back for a visit. And I like your site, too. A lot of the stuff I see online by ex-Witnesses is heavy with the bitterness and light on helpful advice. Yours is not. Plus, you’re an atheist too. How could I NOT link to your site? Without God, life is everything.